Marisela Castro saw kids sneak snacks into their backpacks at the afterschool program where she worked while attending SJSU. “One boy confided that he hadn’t seen his father in a week, and couldn’t remember the last time his whole family was together,” says Castro, ’12 Sociology/Criminology. “His parents were working nonstop at multiple minimum wage jobs.” Castro related to his hopelessness. She saw her afterschool program students struggle academically and develop behavioral issues likely because their families were barely making enough for necessities. “The situation created a drive in me to find a solution,” she says. But it wasn’t easy. As a transfer student, Castro didn’t know anyone. She couldn’t generate interest for her idea until she took a Social Action course in spring 2011, where Leila McCabe, ’12 Sociology, and others joined the effort. Class research showed that a city-wide minimum wage increase would stimulate the local economy without growing unemployment or harming small businesses, and would help low wage workers afford Silicon Valley’s steep housing costs. 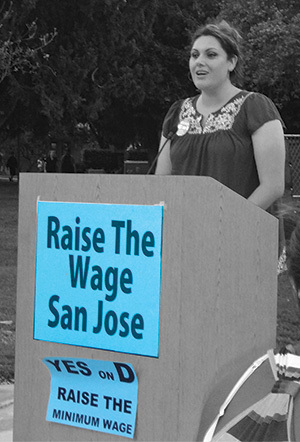 McCabe created the Campus Alliance for Economic Justice, CAFE J, which began meeting with community, faith and labor leaders to plan to raise San Jose’s minimum wage from $8 to $10 an hour. The student coalition raised money and awareness, and organized volunteers who collected 36,000 signatures—almost double the required amount—to place Measure D on the November 2012 ballot. It passed with 60 percent of the vote, showing “if you work hard and play by the rules, you deserve a fair wage,” Myers-Lipton says. The story of how these students got the minimum wage raised was told in The Nation, The Wall Street Journal and MSNBC.